President Paul Kagame has congratulated the leaders of Ethiopia and Eritrea for signing historical deal to end decades of armed strife. Today, the Prime Minister of Ethiopia Abiy Ahmed and Eritrea President Isaias Afwerki signed a “joint declaration of peace and friendship”, according to media reports quoting Eritrea’s information minister Yemane Gebremeskel. President Paul Kagame who is also the current Chairperson of the African Union, welcomed the move as ‘the right thing’ for people of both countries. “We salute the leaders, PM of Ethiopia Dr. Abiy Ahmed and President Isaias Afewerki of Eritrea for their courage and doing the right thing for the people of the two countries! We congratulate you and are with you…. !,” Kagame posted on his Twitter handle. Yesterday, President Isaias Afwerki and Prime Minister Abiy Ahmed begun their tete-a-tete meetings, meant to “set the tone for rapid, positive changes on the basis of respect of sovereignty and territorial integrity, equality and mutual interest of both countries,” according to Minister Gebremeskel. Addressing the African Union Heads of State and Government in Nouakchott, Mauritania on July 1, 2018, Kagame paid tribute to the current tremendous progress in restoring peace and relations in Ethiopia, Eritrea and South Sudan. “We are heartened by the strides made by the leadership of Eritrea and Ethiopia toward the normalisation of relations. You have the African Union’s unwavering support,” Kagame said. The signing of the deal took place today at Eritrea State House. 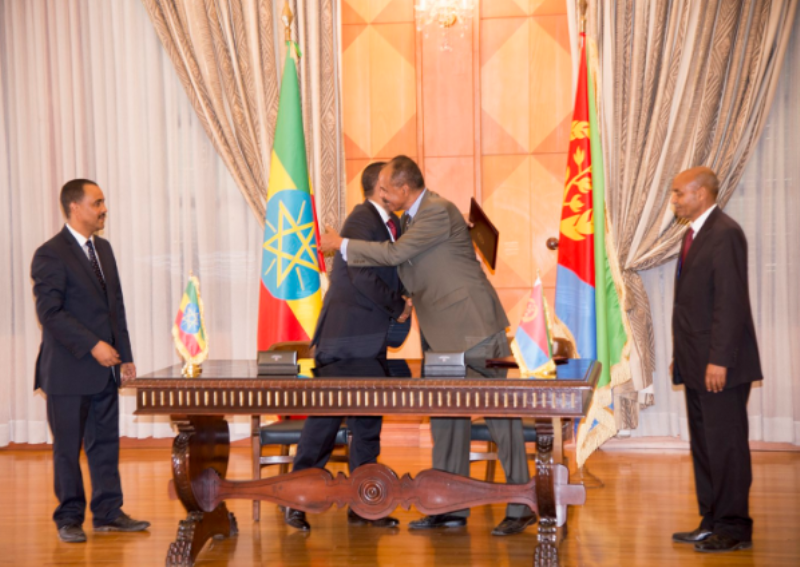 “Eritrea and Ethiopia have signed a Joint Declaration of Peace and Friendship today. 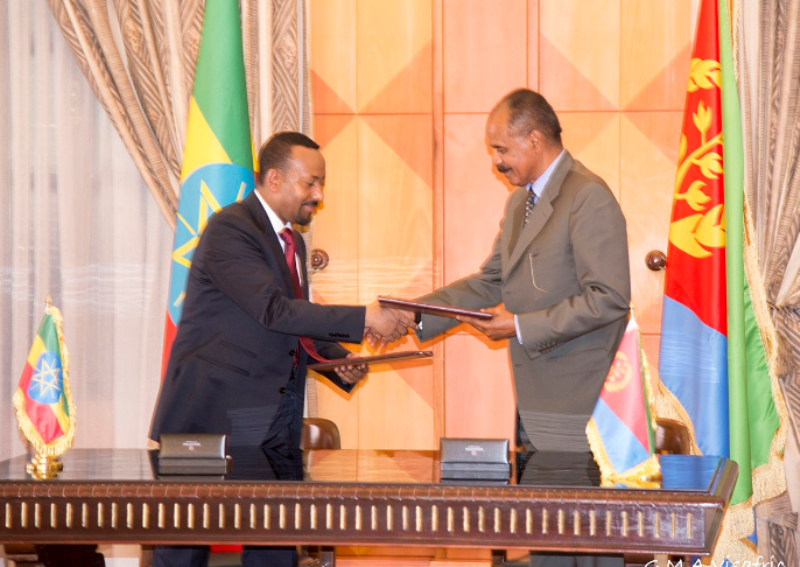 The Agreement, which specifies five pillars, was signed this morning at State House by President Isaias Afwerki and Prime Minister Abiy Ahmed,” said Minister Gebremeskel on his Twitter handle. On his part, Prime Minister Abiy said: “enough of war and news of imminent war… I congratulate the peoples of Eritrea and Ethiopia as we embark on a promising chapter of peace and stability by bringing to an end In addition, transport, trade and telecommunication ties will be resumed and diplomatic ties and activities renewed. Finally, previously made border decision will be implemented and both countries will work together to guarantee regional peace, development and cooperation. A peace deal ending the border war in which more than 70,000 people died, was signed in December 2000, but Ethiopia refused to accept the final ruling of a border commission two years later, which awarded disputed territory to Eritrea, including the town of Badme. The first of the five pillars under the deal states that the war that existed between the two countries has ended. Other pillars declare that a new era of peace and friendship has been ushered and that both countries will work to promote close cooperation in political, economic, social, cultural and security areas.